Keep an eye on the Moon as it creeps above the eastern skyline. The golden orb may appear strangely inflated. This is the Moon illusion at work. For reasons not fully understood by astronomers or psychologists, a low-hanging Moon appears much wider than it really is. A Harvest Moon inflated by the moon illusion is simply gorgeous. The view improves as the night wears on. 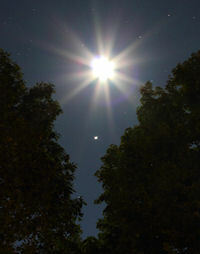 A Moon-Jupiter conjunction on Aug. 26, 2010. Credit: Tom Cocchiaro. Northern summer changes to fall on Sept. 22nd at 11:09 pm EDT. At that precise moment, called the autumnal equinox, the Harvest Moon can be found soaring high overhead with the planet Jupiter right beside it. The two brightest objects in the night sky will be in spectacular conjunction to mark the change in seasons. 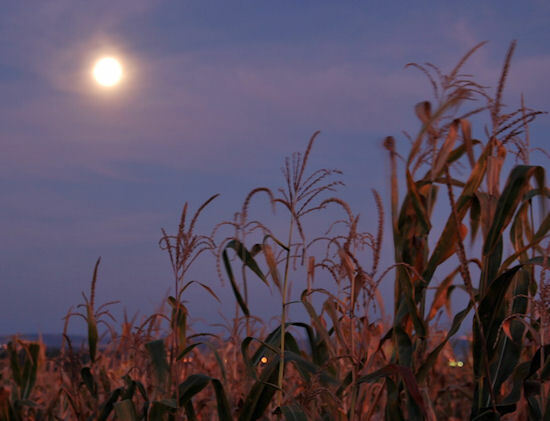 A Super Harvest Moon, a rare twilight glow, a midnight conjunction—rarely does autumn begin with such celestial fanfare.